To change between entry modes, with the vehicle unlocked, press the lock and unlock buttons simultaneously for 3 seconds. The hazard warning lamps will flash twice to confirm the change. Press once to lock the vehicle and arm the exterior alarm. To also close any open windows, press and hold for 3 seconds (Global closing). Multi-point entry - press once to disarm the alarm, unlock all doors and the luggage compartment. Single-point entry - press once to disarm the alarm and unlock the driver’s door. A second press unlocks the passenger door and the luggage area. Press and hold to also open the windows (Global opening). With either method the door handles will be presented for opening. While the Smart key is within 3 ft (1m) of the vehicle, simply press a door handle button to unlock the vehicle and disarm the alarm. Pressing the luggage compartment release button allows access to the luggage compartment but the vehicle doors remain locked. To lock the vehicle and arm the alarm, first make sure the Smart key is outside the vehicle but within 3 ft (1m). Single-locking - press the door handle gently, the door handle will retract. The doors and luggage compartment will lock and the exterior alarm will be activated. Doors can still be unlocked from inside the vehicle. When locking it is advisable to have the hood up. Loose coins in the same pocket as the Smart key can also act as a shield. Keep the Smart key clear of possible shielding when attempting Keyless entry or Keyless starting. If the Smart key is not detected and the message Smart Key Not Found is displayed, hold it in the indicated position. Start the engine as normal. The Smart key can now be removed. Press once to switch the headlamps on for up to 120 seconds. Press again to switch off. Press to open only the luggage compartment. The rest of the security system remains active. Press and hold for 3 seconds to activate/cancel the panic alarm. Do not leave your Smart key within the luggage compartment, the vehicle WILL NOT automatically unlock (should it become shielded). Set the seat position using the following controls. 3. Memory preset buttons 1, 2 and 3. 5. Seat forwards and back, cushion height and cushion angle. 6. Side bolsters inflate and deflate. 7. With the vehicle stationary, adjust tilt and reach of the steering column to your ideal driving position. 8. Press the left or right mirror selector. Use the mirror adjuster to set mirror positions. When you have adjusted the driver’s seat, steering column and door mirrors to your ideal driving position, the settings can be stored. Press the memory set button to activate the memory store function. The button will illuminate to indicate the memory store function is active. Within 5 seconds, press button 1, 2 or 3 to store the current driving position. A stored memory position can now be recalled with a press of the appropriate button. The seat, steering wheel and mirrors will move to their preset positions. Memory buttons must be pressed within 5 seconds after pressing the memory set button, otherwise the memory store function will cancel. The engine will continue to run even if the Smart key is removed from the vehicle. However, if the engine is stopped, it cannot be restarted until the Smart key is returned to the vehicle. • With the Smart key inside the vehicle, press the START/STOP button to switch on ignition. • A second press will switch off the ignition. • The transmission must be in Park or Neutral position. • With the foot brake depressed, press and release the START/STOP button. • Press again to stop the engine and switch off the ignition. If the engine is switched off while the vehicle is moving, it can be restarted after 2 seconds have elapsed by selecting transmission N position then pressing the START/STOP button. 1. The brake pedal must be depressed before and while the selector is moved from P.
2. The selector release button must be pressed when moving from P or N.
3. Move the selector backward to D or forward to N or forward again to R. An LED on top of the selector will illuminate to indicate current gear selection. 4. To select Sport (S) mode when in D, move the selector to the left. The selector can now be moved forward to move up a gear and back to move down a gear. To return to fully automatic mode, move the selector back to D.
5. To select Park , simply press the P switch on top of the selector. This can be done while in any gear selection. The vehicle must be stationary when P is selected. If the engine is switched off with any other gear still selected, the transmission will automatically return to P.
If the engine is switched off with N selected, automatic selection of P is delayed for 10 minutes. This allows enough time for the vehicle to be conveyed through an automatic car wash. DO NOT use this feature to enable towing of the vehicle. Refer to Vehicle recovery in the Owner’s Handbook. To operate the convertible roof, the ignition must be on and road speed below 30 mph (50 km/h). 1. To open the roof, push down and hold the front of the switch. 2. A warning will sound and the side windows will drop slightly. The warning will sound again when the roof is fully open. 3. Release the switch when the roof is fully open. Closing is a reverse of this procedure. Lift the front of the switch up until the roof is fully closed and latched. • With the ignition on, apply the foot brake and press down on the parking brake switch. • If the vehicle is stationary with the parking brake applied and either D or R selected, pressing the accelerator will automatically release the parking brake. • With the vehicle stationary, lift up the parking brake switch and then release it. The red warning lamp in the instrument panel will illuminate. Cruise control disengages when brakes are applied or when speed is below 18 mph (30 km/h). Cruise control will cancel if the accelerator is used for more than 5 minutes. 1. When AUTO is selected with the rotary control, side lamps and headlamps will turn on automatically as ambient light fades. With the control in the low beam position, High beam assist will activate automatically when ambient light falls below a pre set level. Vehicle speed must be above 25 mph (40 km/h). To override High beam assist and select low beam, pull the lighting control backwards to the flash position and release. To reinstate High beam assist, push the lighting control forward to the high beam position, then back to low beam position. 2. 3, 4. The headlamps can be set to temporarily light the way ahead when exiting the vehicle at night. Rotate the control for exit delay periods of 30 seconds, 60 seconds or 120 seconds. 1. Accelerate to the desired speed then press to set and maintain the cruise speed. This can also be used to increase speed while cruise control is operating. 2. Resumes the set speed after cruise control has been suspended. 3. Press to decrease the set speed. 4. Suspends cruise control but retains current set speed in memory. 5. ASL on/off. The Automatic speed limiter button switches between cruise control and ASL. Intelligent stop/start is automatically activated when the ignition is turned on. If the vehicle is stopped and the brake is applied, the engine will turn off (unless it is required to support other vehicle systems). When the brake is released and a drive gear is selected the engine will restart. A warning lamp on the instrument panel will illuminate while the engine is switched off by Intelligent stop/start. Press the Intelligent stop/start switch to turn off or on. Note: The engine will restart automatically if the switch is pressed while an automatic engine stop is in progress. When the ignition is turned off and on again, Intelligent stop/start will be reinstated. If shift paddles are used with D selected, the transmission will revert to automatic mode if use of the paddles is not maintained. With S selected, manual operation is maintained until D is selected again. 1. To shift down a gear, briefly pull the left paddle. 2. To shift up a gear, briefly pull the right paddle. 3. To exit manual gear shift mode, pull and hold the right paddle for one second. This will return the transmission to automatic operation in D.
With ASL selected, a maximum speed can be set. The engine will respond normally up to that speed but further accelerator pressure will not allow the set speed to be exceeded. Kickdown use will over-ride the ASL setting allowing a higher speed to be reached. When kickdown is used, ASL is cancelled. 1. Press to set a maximum speed. A higher maximum speed can be set at any time. 2. Resumes ASL assistance after a suspension. 3. Press to decrease the speed limit. Note: The set speed will be displayed in the Message center. The spoiler will raise automatically when speed reaches 60 mph (96 km/h) and close when speed drops below 40 mph (64 km/h). Press and release the button to raise the spoiler manually at speeds below 60 mph (96 km/h). Press and hold the button to lower the spoiler. Note: If the spoiler is left partially lowered, press and release the button to fully raise the spoiler before lowering. vehicle driving characteristics to suit prevailing conditions. 1. Rain/ice/snow mode. Use in slippery road conditions. 2. Dynamic mode. Co-ordinates vehicle systems to deliver a high performance driving experience. 3. DSC. The default condition at engine start is DSC on and is designed to control vehicle stability. DSC can be switched off if required. Press and hold the switch for more than 3 seconds. The DSC warning lamp will illuminate and the Message center will display DSC Off until DSC is reinstated. Turn DSC on again with a short press and release the switch. TracDSC is an alternative setting that optimises the DSC settings for maximum traction. TracDSC enables a more involving and focused driving experience on dry tarmac. Note: Normal stability control may be impaired. To select TracDSC, press and hold the DSC switch for less than 3 seconds. When TracDSC is selected, the DSC warning lamp will illuminate and the Message center will briefly display TracDSC. Note: Cruise control can only be used when DSC is on. Each mirror displays amber icons 1 to warn of overtaking vehicles in adjacent lanes. The monitored area extends approximately 20 ft (6m) behind the rear wheels and 8.2 ft (2.5m) to the sides. It switches on automatically at speeds above 6 mph (10 km/h) while in a forward gear. The amber dot 2 is illuminated while speed is below the threshold. This feature can be used to improve the passenger side lower view while reversing. 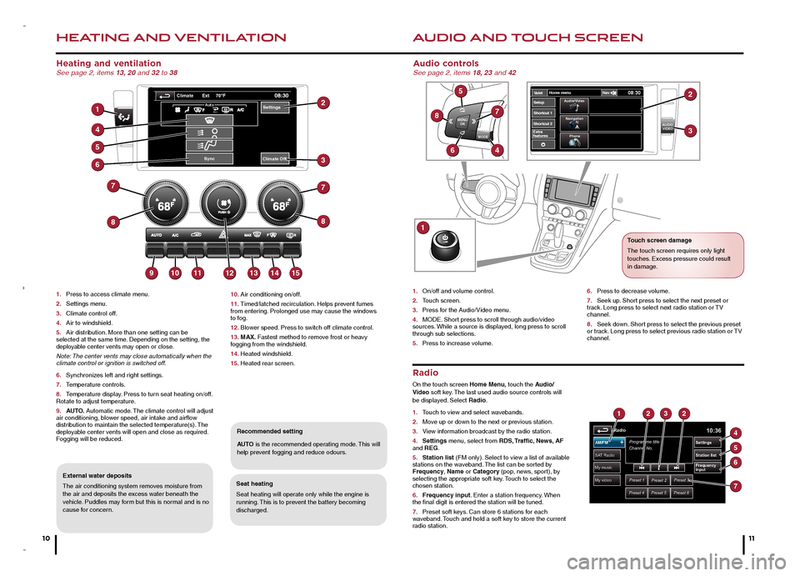 Mirror dip can be selected or deselected from the instrument panel menu. 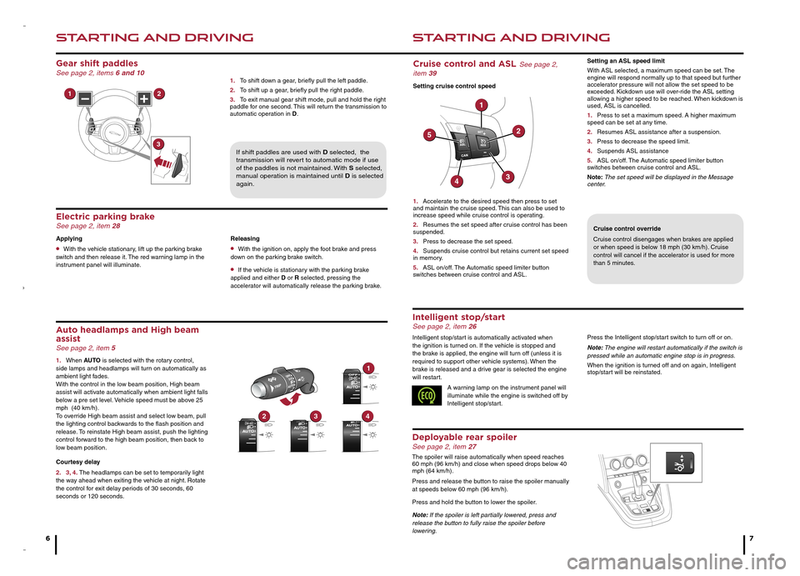 Select Features from the Vehicle Settings menu, then select the desired option from the list. • With the Electric parking brake on, select reverse gear. 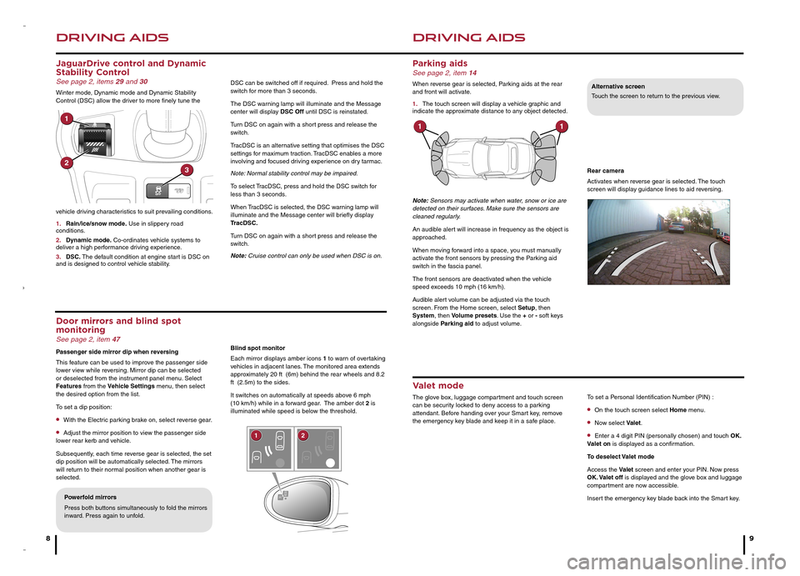 • Adjust the mirror position to view the passenger side lower rear kerb and vehicle. 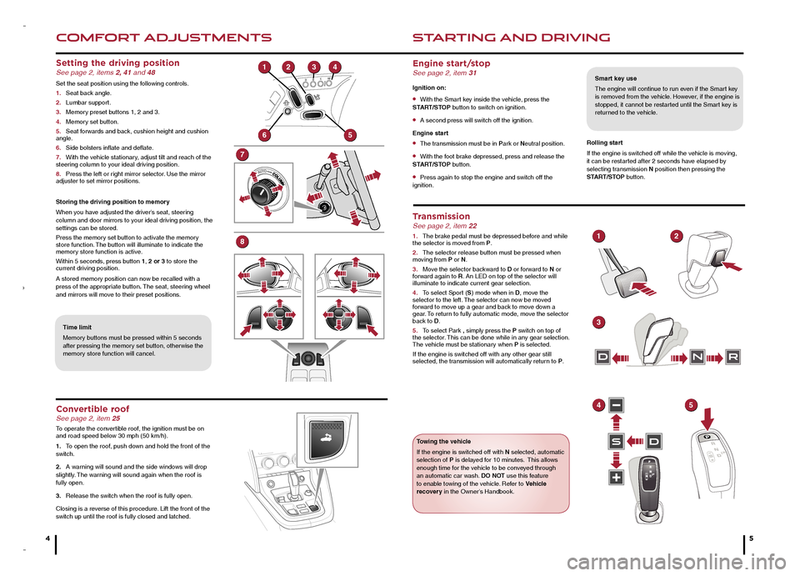 Subsequently, each time reverse gear is selected, the set dip position will be automatically selected. The mirrors will return to their normal position when another gear is selected. When reverse gear is selected, Parking aids at the rear and front will activate. 1. The touch screen will display a vehicle graphic and indicate the approximate distance to any object detected. Note: Sensors may activate when water, snow or ice are detected on their surfaces. Make sure the sensors are cleaned regularly. An audible alert will increase in frequency as the object is approached. When moving forward into a space, you must manually activate the front sensors by pressing the Parking aid switch in the fascia panel. The front sensors are deactivated when the vehicle speed exceeds 10 mph (16 km/h). Audible alert volume can be adjusted via the touch screen. From the Home screen, select Setup, then System, then Volume presets. Use the + or - soft keys alongside Parking aid to adjust volume. Touch the screen to return to the previous view. Activates when reverse gear is selected. 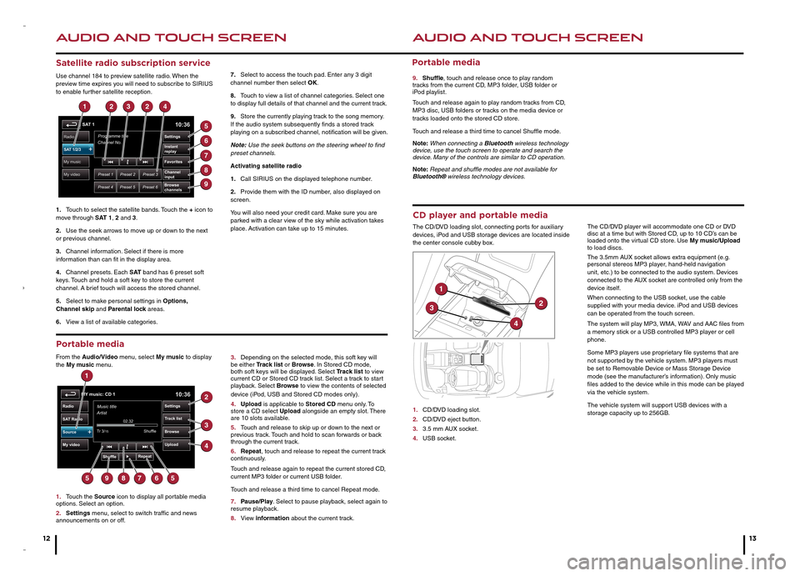 The touch screen will display guidance lines to aid reversing. The glove box, luggage compartment and touch screen can be security locked to deny access to a parking attendant. Before handing over your Smart key, remove the emergency key blade and keep it in a safe place. • On the touch screen select Home menu. • Enter a 4 digit PIN (personally chosen) and touch OK. Valet on is displayed as a confirmation. Access the Valet screen and enter your PIN. Now press OK. Valet off is displayed and the glove box and luggage compartment are now accessible. Press both buttons simultaneously to fold the mirrors inward. Press again to unfold. 1. Press to access climate menu. 5. Air distribution. More than one setting can be selected at the same time. Depending on the setting, the deployable center vents may open or close. Note: The center vents may close automatically when the climate control or ignition is switched off. 6. Synchronizes left and right settings. 8. Temperature display. Press to turn seat heating on/off. Rotate to adjust temperature. 9. AUTO. Automatic mode. The climate control will adjust air conditioning, blower speed, air intake and airflow distribution to maintain the selected temperature(s). The deployable center vents will open and close as required. Fogging will be reduced. Seat heating will operate only while the engine is running. This is to prevent the battery becoming discharged. AUTO is the recommended operating mode. This will help prevent fogging and reduce odours. The air conditioning system removes moisture from the air and deposits the excess water beneath the vehicle. Puddles may form but this is normal and is no cause for concern. On the touch screen Home Menu, touch the Audio/Video soft key. The last used audio source controls will be displayed. Select Radio. 1. Touch to view and select wavebands. 2. Move up or down to the next or previous station. 3. View information broadcast by the radio station. 4. Settings menu, select from RDS, Traffic, News, AF and REG. 5. Station list (FM only). Select to view a list of available stations on the waveband. The list can be sorted by Frequency, Name or Category (pop, news, sport), by selecting the appropriate soft key. Touch to select the chosen station. 6. Frequency input. Enter a station frequency. When the final digit is entered the station will be tuned. 7. Preset soft keys. Can store 6 stations for each waveband. Touch and hold a soft key to store the current radio station. 1. On/off and volume control. 3. Press for the Audio/Video menu. 4. MODE. Short press to scroll through audio/video sources. While a source is displayed, long press to scroll through sub selections. 5. Press to increase volume. 6. Press to decrease volume. 7. Seek up. Short press to select the next preset or track. Long press to select next radio station or TV channel. 8. Seek down. Short press to select the previous preset or track. Long press to select previous radio station or TV channel. 11. Timed/latched recirculation. Helps prevent fumes from entering. Prolonged use may cause the windows to fog. 12. Blower speed. Press to switch off climate control. 13. MAX. Fastest method to remove frost or heavy fogging from the windshield. The touch screen requires only light touches. Excess pressure could result in damage. The CD/DVD loading slot, connecting ports for auxiliary devices, iPod and USB storage devices are located inside the center console cubby box. 3. 3.5 mm AUX socket. The CD/DVD player will accommodate one CD or DVD disc at a time but with Stored CD, up to 10 CD’s can be loaded onto the virtual CD store. Use My music/Upload to load discs. The 3.5mm AUX socket allows extra equipment (e.g. personal stereos MP3 player, hand-held navigation unit, etc.) to be connected to the audio system. Devices connected to the AUX socket are controlled only from the device itself. When connecting to the USB socket, use the cable supplied with your media device. iPod and USB devices can be operated from the touch screen. The system will play MP3, WMA, WAV and AAC files from a memory stick or a USB controlled MP3 player or cell phone. Some MP3 players use proprietary file systems that are not supported by the vehicle system. MP3 players must be set to Removable Device or Mass Storage Device mode (see the manufacturer’s information). Only music files added to the device while in this mode can be played via the vehicle system. The vehicle system will support USB devices with a storage capacity up to 256GB. Use channel 184 to preview satellite radio. When the preview time expires you will need to subscribe to SIRIUS to enable further satellite reception. 1. Touch to select the satellite bands. Touch the + icon to move through SAT 1, 2 and 3. 2. Use the seek arrows to move up or down to the next or previous channel. 3. Channel information. Select if there is more information than can fit in the display area. 4. Channel presets. Each S AT band has 6 preset soft keys. Touch and hold a soft key to store the current channel. A brief touch will access the stored channel. 5. Select to make personal settings in Options, Channel skip and Parental lock areas. 6. View a list of available categories. 7. Select to access the touch pad. Enter any 3 digit channel number then select OK.
8. Touch to view a list of channel categories. Select one to display full details of that channel and the current track. 9. Store the currently playing track to the song memory. If the audio system subsequently finds a stored track playing on a subscribed channel, notification will be given. Note: Use the seek buttons on the steering wheel to find preset channels. 1. Call SIRIUS on the displayed telephone number. 2. Provide them with the ID number, also displayed on screen. You will also need your credit card. Make sure you are parked with a clear view of the sky while activation takes place. Activation can take up to 15 minutes. From the Audio/Video menu, select My music to display the My music menu. 1. Touch the Source icon to display all portable media options. Select an option. 2. Settings menu, select to switch traffic and news announcements on or off. 3. Depending on the selected mode, this soft key will be either Track list or Browse. In Stored CD mode, both soft keys will be displayed. Select Track list to view current CD or Stored CD track list. Select a track to start playback. Select Browse to view the contents of selected device (iPod, USB and Stored CD modes only). 4. Upload is applicable to Stored CD menu only. To store a CD select Upload alongside an empty slot. There are 10 slots available. 5. Touch and release to skip up or down to the next or previous track. Touch and hold to scan forwards or back through the current track. 6. Repeat, touch and release to repeat the current track continuously. Touch and release again to repeat the current stored CD, current MP3 folder or current USB folder. Touch and release a third time to cancel Repeat mode. 7. Pause/Play. Select to pause playback, select again to resume playback. 8. View information about the current track. 9. Shuffle, touch and release once to play random tracks from the current CD, MP3 folder, USB folder or iPod playlist. Touch and release again to play random tracks from CD, MP3 disc, USB folders or tracks on the media device or tracks loaded onto the stored CD store. Touch and release a third time to cancel Shuffle mode. Note: When connecting a Bluetooth wireless technology device, use the touch screen to operate and search the device. Many of the controls are similar to CD operation. Note: Repeat and shuffle modes are not available for Bluetooth® wireless technology devices. With a phone paired and active, press the PHONE button below the touch screen. 1. Select Digit dialing, Phonebook or Last 10. With Digit dialing selected, use the keypad to enter the number. With Phonebook selected, choose a number from the downloaded phonebook. Last 10 displays the previous 10 calls. Choose one to dial. 2. To make the call touch the connect icon . The icon will change to a connected call icon. 3. To end a call touch . On initial activation, make sure that both the correct country and search area have been selected. For more information refer to the Navigation section of the Owner’s Handbook. NOTE: To access navigation press either the N AV hard key or touch the Nav icon on the Home menu. 1. Use to enter a new destination. Provides a choice of options when entering a destination. 2. Displays previous destinations entered. Previous destinations can be selected as a new destination. 3. Turns the POI (Point Of Interest) icons on the map on/off. 4. When a destination is set, the Jaguar logo in this position is replaced by a soft key which enables the last voice instruction to be repeated. 5. Soft key is highlighted while voice guidance is enabled. Touch to turn voice guidance off. 6. POI shortcuts: Touch icon to list available POIs that are close to the vehicle position. 7. Calculates a detour from the current route. 8. Advances to the main map screen. 9. There are 2 navigation menu screens. Use the More... soft key to toggle between them. The second map screen features the following soft keys. Stored locations. Used to manage the stored data. TMC (Traffic Message Channel). Provides data about road conditions and any events that may affect the current route. Route options. Allows selection of various options for the route. Nav set-up. For setting personal preferences within the navigation system. When navigation is selected after the ignition is turned on, a caution screen is displayed. Touch Agree. Note: At the first time of accessing the caution screen, set the required language. Select Address and enter address details using the keyboard. As each part of the address is refined, touch OK or List to display all the streets and towns that are available for selection. If the house number is not known, press OK, the mid-point of the road is then used as the destination. When the address entry fields are complete, press OK to move to the map screen. The map screen will display the selected destination.Touch GO to start route calculation. Touch Review route if you want to take an alternative route. Touch Go to start guidance. There will be a choice of 3 routes or Change route. 3 routes will display 3 different route options on the map. Select Route 1, 2 or 3 by touching the respective box displayed on the right side of the map and then select GO. Connection must be made with ignition on or engine running. Use the following procedure in conjunction with your phone manufacturer’s instructions. 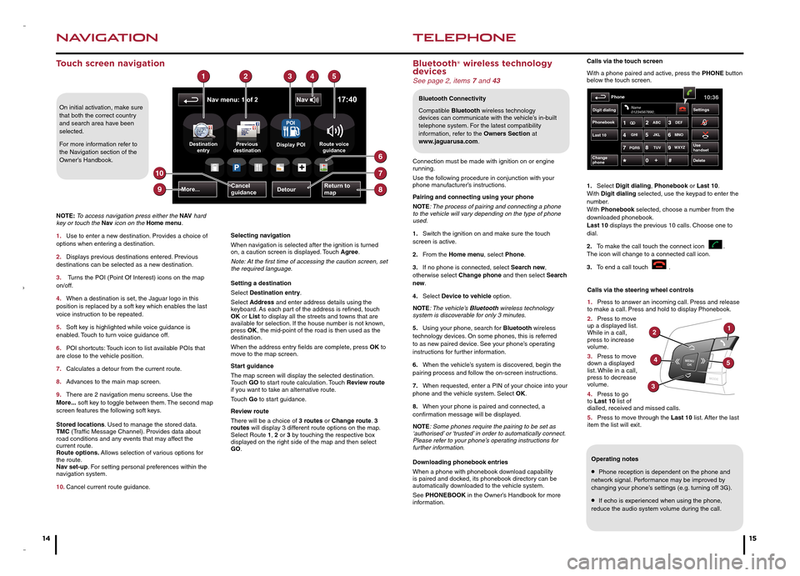 NOTE: The process of pairing and connecting a phone to the vehicle will vary depending on the type of phone used. 1. Switch the ignition on and make sure the touch screen is active. 2. From the Home menu, select Phone. 3. If no phone is connected, select Search new, otherwise select Change phone and then select Search new. 4. Select Device to vehicle option. NOTE: The vehicle’s Bluetooth wireless technology system is discoverable for only 3 minutes. 5. Using your phone, search for Bluetooth wireless technology devices. On some phones, this is referred to as new paired device. See your phone’s operating instructions for further information. 6. 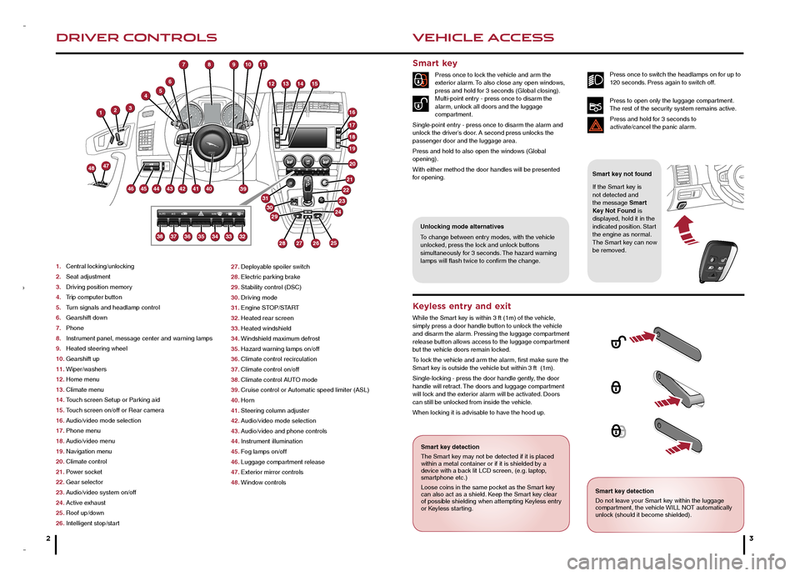 When the vehicle’s system is discovered, begin the pairing process and follow the on-screen instructions. 7. When requested, enter a PIN of your choice into your phone and the vehicle system. Select OK.
8. When your phone is paired and connected, a confirmation message will be displayed. NOTE: Some phones require the pairing to be set as ‘authorised’ or ‘trusted’ in order to automatically connect. Please refer to your phone’s operating instructions for further information. When a phone with phonebook download capability is paired and docked, its phonebook directory can be automatically downloaded to the vehicle system. See PHONEBOOK in the Owner’s Handbook for more information. Compatible Bluetooth wireless technology devices can communicate with the vehicle’s in-built telephone system. 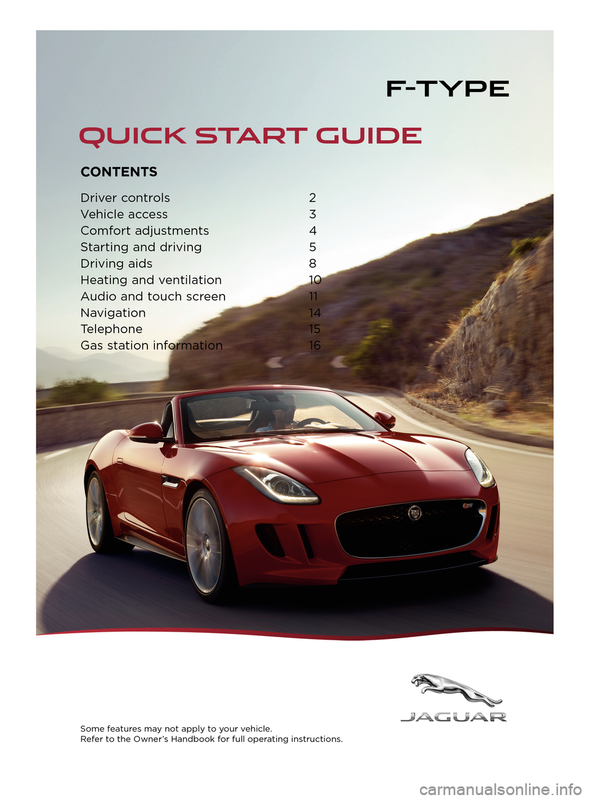 For the latest compatibility information, refer to the Owners Section at www.jaguarusa.com. 1. Press to answer an incoming call. Press and release to make a call. Press and hold to display Phonebook. 2. Press to move up a displayed list. While in a call, press to increase volume. 3. Press to move down a displayed list. While in a call, press to decrease volume. 4. Press to go to Last 10 list of dialled, received and missed calls. 5. Press to move through the Last 10 list. After the last item the list will exit. • Phone reception is dependent on the phone and network signal. Performance may be improved by changing your phone’s settings (e.g. turning off 3G). • If echo is experienced when using the phone, reduce the audio system volume during the call. The vehicle must be in an unlocked condition before the fuel filler flap can be opened. Press the fuel filler flap firmly approximately 1.4 in (35mm) from the rear edge and release. 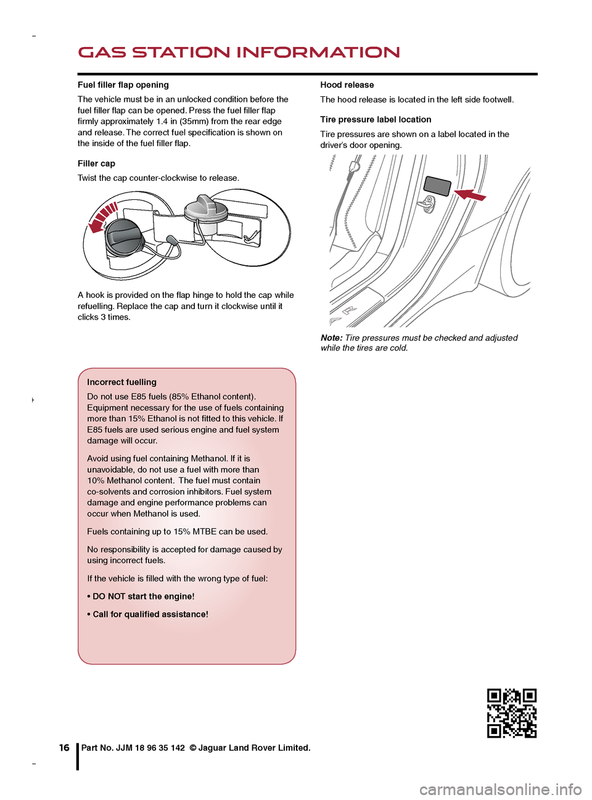 The correct fuel specification is shown on the inside of the fuel filler flap. Twist the cap counter-clockwise to release. A hook is provided on the flap hinge to hold the cap while refuelling. Replace the cap and turn it clockwise until it clicks 3 times. Do not use E85 fuels (85% Ethanol content). Equipment necessary for the use of fuels containing more than 15% Ethanol is not fitted to this vehicle. If E85 fuels are used serious engine and fuel system damage will occur. Avoid using fuel containing Methanol. If it is unavoidable, do not use a fuel with more than 10% Methanol content. The fuel must contain co-solvents and corrosion inhibitors. Fuel system damage and engine performance problems can occur when Methanol is used. Fuels containing up to 15% MTBE can be used. No responsibility is accepted for damage caused by using incorrect fuels. • DO NOT start the engine! • Call for qualified assistance! The hood release is located in the left side footwell. Tire pressures are shown on a label located in the driver’s door opening. Note: Tire pressures must be checked and adjusted while the tires are cold. Part No. JJM 18 96 35 142 © Jaguar Land Rover Limited.